Dissidia 012 Final Fantasy (ディシディア デュオデシム ファイナルファンタジー, Dishidia Dyuodeshimu Fainaru Fantajī, pronounced "Dissidia Duodecim Final Fantasy") is a 2011 fighting game published by Square Enix for the PlayStation Portable as part of the Final Fantasy series. It was developed by the company's 1st Production Department and released in Japan on March 3, 2011. The game is both a prequel and remake of Dissidia Final Fantasy, revealing what occurred before the events of its predecessor, and was released on March 22, 2011 in North America. The mechanics of the battle system include "EX Revenge" and "Assist." EX Mode functions exactly the same as the first game by collecting EX Cores around the battle map to fill up the EX gauge and transform the character into a more powerful state, which allows players to perform a powerful EX Burst attack should an HP attack land during EX Mode. The Assist system is a new element to the game which allows the player to summon an additional ally into battle to either assist in attacking the enemy or defend from an oncoming attack. It is performed using the Assist Gauge, which is built up by using Bravery Attacks. Both modes are supposed to balance each other, because when an EX Burst is executed, the opponent's Assist Gauge is reduced to zero. The three main countering systems are Assist Breaks, EX Breaks and EX Revenge. An Assist Break is performed by attacking the opponent's Assist character while the player is in EX Mode, causing him/her to be unable to call out the Assist character for a brief period; this also passes the stage's Bravery points to the character. An EX Break is performed by stopping an opponent's EX Mode through the use of an Assist attack which forces the opponent out of EX Mode, additionally passing the stage's Bravery points to the player. Lastly, EX Revenge occurs when trying to activate EX Mode while being attacked. While in the first game it would simply halt the opponent's attack, it now slows down time allowing the player to pummel the opponent instead, though it sacrifices the player's ability to use an EX Burst as it uses up the entire EX Gauge. A screenshot showing the single-player mode of the game. The game's world map, with new characters Lightning, Kain and Tifa as the three-member party. The biggest addition is within the single-player story mode of the game, taking place on a traditional-styled Final Fantasy world map, with players being able to experience a story while exploring a world with scenarios and events taking place as the story progresses. Players traverse the 3D world map with parties consisting of up to five characters, with players being able to interact in conversations with the characters. When roaming the map, players will encounter enemies known as "Manikins"; when attacked by an enemy, players will be transported to a battle map where battles will take place. There are specially marked shops on the map. The story mode is also party based, similar to the story progression of Final Fantasy VI. In certain scenarios, parties will be predetermined, but in most cases players are free to select their own party. Alongside the game's new story mode, the game also includes the first game's story, which has been remade with the 3D world map as well as additional elements added for the new storyline. Tetsuya Nomura, producer and character designer for the game, has said that both storylines played together would result in approximately 60 hours of gameplay. The game's main story revolves around the twelfth cycle of the eternal conflict between the gods Cosmos and Chaos, who have both summoned several warriors from different worlds  to fight for them in "World B", a mirror dimension to the realm of World A. It features the entire cast of the original Dissidia with new and tweaked abilities, and introduces nine new playable characters for a total of thirty-one. Six of the new characters are available from the start of the game: Lightning, a former soldier and the protagonist of Final Fantasy XIII; Vaan, a sky pirate and the protagonist of Final Fantasy XII; Laguna Loire, the man who appears in Squall's dreams and the secondary protagonist of Final Fantasy VIII; Yuna, Tidus's love interest and female protagonist of Final Fantasy X; Kain Highwind, Cecil Harvey's childhood friend and rival from Final Fantasy IV; and Tifa Lockhart, Cloud Strife's childhood friend from Final Fantasy VII. The remaining three characters, which can be unlocked through various means of gameplay, are Prishe, a supporting character from Final Fantasy XI; Gilgamesh, a recurring villain from Final Fantasy V; and Feral Chaos (デスペラードカオス, Desuperādo Kaosu), an alternate form of Chaos. Final Fantasy VII's Aerith Gainsborough is available as an assist-only character (i.e. not fully playable in the game) through the purchase of Dissidia 012 Prologus Final Fantasy on the PlayStation Network. During the twelfth cycle, the war is turning in favor of Chaos. Therefore, Cosmos entrusts her warriors with the task of retrieving the crystals that will help them defeat Chaos. However, Cosmos does not foresee Chaos's forces employing an unworldly army of crystalline soldiers known as Manikins, which pose a threat due to their ability to negate the gods' power to revive the warriors after they are killed. Believing their defeat to be inevitable, Kain and the Warrior of Light defeat most of their own allies to stop them from fighting the Manikins and return in the upcoming cycle. Lightning opposes this plan and leads the other active warriors—Vaan, Yuna, Laguna, and Tifa—to stop the Manikins once and for all by sealing the portal from which they emerge, with Kain eventually joining them as well. Though they succeed, Cosmos is reduced to a weakened state after using much of her power to diminish the Manikin army when they attempt to kill her and the Warrior of Light, while Lightning and her group succumb to the Manikins' power and fade away. From there, the game retells the events of Dissidia Final Fantasy where returning warriors for Cosmos participate in the thirteenth cycle that ends the conflict between the gods. Once completing the thirteenth cycle, the player also has access to the third and final arc "Confessions of the Creator", in which Shinryu—a powerful entity that absorbs the warriors' memories and experiences following each cycle—traps Cosmos' comrade, Cid of the Lufaine, in a nightmare world where the cycles never end as punishment for saving Cosmos' warriors from the thirteenth cycle following Chaos' defeat. The player selects five characters to fight Feral Chaos, a stronger incarnation of Chaos, and save the imprisoned Cid the nightmare world. In addition to the main story is a set of "Reports", most of which follow the other warriors who participate in the thirteenth cycle, explaining their roles before and during that cycle. Prominent characters in these reports include warriors of Cosmos—Terra, Cloud and Tidus—who fight for the side of Chaos during the twelfth cycle, and Chaos's warrior Jecht, who appears on the side of Cosmos, with the reports detailing how these characters came to switch sides. Furthermore, the Reports cover other events such as how the Warrior of Light enters the conflict and meets Cosmos's previous warriors Prishe and Shantotto, along with Gilgamesh's misadventures upon stumbling into World B. Ideas for a sequel to Dissidia Final Fantasy were already conceived shortly after its release in Japan with creative producer Tetsuya Nomura wishing to feature Kain Highwind on it. Development of the game started in August 2009 shortly before the release of Dissidia Final Fantasy Universal Tuning, the international version from the prequel. Director Mitsunori Takahashi stated the team wanted the sequel to have more changes than just new characters. This resulted in changes to gameplay features and the inclusion of new ones. The Assist feature was made to add more entertainment to the fights, as well as to act as a counterbalance to the EX Mode that was the strongest area from the first game. This was done in response to feedback commenting that the EX Mode was too powerful in the original game. The world map was created in order to appeal more the RPG fans. Returning characters had their movesets modified to provide the player with new strategies when fighting. One of the most revised ones was Firion due to feedback from players. Since the original Dissidia had a concrete conclusion, the staff decided to make its story a prequel and encourage players to revisit Dissidia once concluding it. Choosing new characters proved difficult as the staff chose them based on their popularity and fighting styles. The amount of new characters was restricted due to memory limitations. Vaan's inclusion met several hardships since his Japanese voice actor, Kouhei Takeda, was busy at the time. They decided to replace Takeda with Kenshō Ono as a result of fan response. Battle system director Takeo Kujiraoka made contact with Hiroyuki Ito regarding the character's design and moves based on his Final Fantasy XII appearances, which was well received by Ito. While designed by Tetsuya Nomura, various of the new alternative outfits the characters were given were based on artworks by Yoshitaka Amano, another designer from the Final Fantasy series. Three other Square Enix games, Final Fantasy Trading Card Game, Kingdom Hearts Birth by Sleep Final Mix, and The 3rd Birthday, give players access to downloadable content in the form of alternate outfits for Vaan, Cloud Strife, and Lightning, respectively. As of June 16, 2011, the PlayStation Network has featured downloadable content for Dissidia 012 Final Fantasy, including character costumes, avatars, and BGM packs. The music for Dissidia 012 Final Fantasy was composed by Takeharu Ishimoto and features multiple rearrangements from previous Final Fantasy themes by other composers. The American band Kidneythieves also sang the second part of the Feral Chaos' boss theme song, "God in Fire." Ishimoto wrote the song and requested Kidneythieves' collaboration with them to which the band stated it was entertaining. 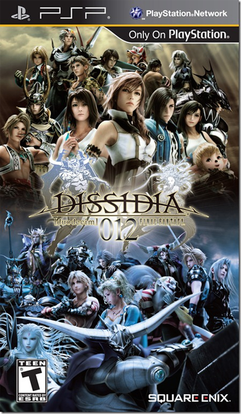 On March 3, 2011, Square Enix released the Dissidia 012 Final Fantasy Original Soundtrack featuring a total of three discs with the first one having 44, the second one 20, and the third one seven. 6. "Canto Mortis ~An Undocumented Battle~"
11. "Gate to the Rift"
17. "Cantata Mortis & God in Fire"
6. "Dissidia 012 Final Fantasy"
7. "Dissidia 012 Final Fantasy"
Upon its first week of release Dissidia 012 sold 286,117 units in Japan, topping the Media Create's charts by replacing Phantasy Star Portable 2 Infinity, Although it managed first place, Dissidia 012 performed far below its predecessor, The original sold close to 500,000 units in its first week in December 18, 2008. It has sold 465,198 units in Japan as of January 2012. It has received positive reception. Dissidia 012 was scored a 38/40 by Famitsu, composed of a 10, 9, 10, 9 score by the four reviewers, two points higher than the original. PSM3 gave the game an 8.2, calling it an "improvement on the original, with some great Final Fantasy fan service thrown in." IGN gave the game a 9.0 (one point higher than the original), praising the game's graphics and improved gameplay, but criticizing its story. Game Informer gave the game a 7, saying the game did not improve any of the battle system problems of the previous game, although the assist system was a good addition, saying it added an extra dimension to what was missing in the first game. GamesRadar+ listed it as the ninth best PlayStation Portable game commenting on how it uses elements from famous RPGs, while IGN listed it third with comments aimed towards its gameplay. ^ a b "「Final Fantasy XIII-2」が2011年発売予定，「Agito」は「Final Fantasy 零式」と名称変更して2011年夏発売。「Square Enix 1st Production Department Premiere」をTwitterで実況". 4Gamer.net (in Japanese). Aetas, Inc. January 18, 2011. Archived from the original on January 19, 2011. Retrieved January 19, 2011. ^ "DISSIDIA 012(duodecim) FINAL FANTASY TO LAUNCH IN NORTH AMERICA ON MARCH 22, 2011". Square Enix. January 20, 2011. Archived from the original on January 24, 2011. Retrieved January 20, 2011. ^ Anoop Gantayat (September 18, 2010). "Date Set For Dissidia Duodecim Final Fantasy". Andriasang. Archived from the original on December 20, 2010. Retrieved December 18, 2010. ^ Bastien (December 20, 2010). "Dissidia 012 : le 25 mars 2011 en Europe". Final Fantasy Ring. Archived from the original on December 22, 2010. Retrieved December 24, 2010. ^ Michael McWhertor (September 7, 2010). "Final Fantasy Fighting Game Gets A Sequel Struck By Lightning". Kotaku. Gawker Media. Archived from the original on November 8, 2013. Retrieved September 7, 2010. ^ a b c Anoop Gantayat (November 22, 2010). "Dissidia 012 Final Fantasy: Vaan, EX Revenge and Breaks". Andriasang. Archived from the original on November 25, 2010. Retrieved December 14, 2010. ^ a b c d Anoop Gantayat (December 15, 2010). "Dissidia Duodecim Final Fantasy Update". Andriasang. Archived from the original on December 17, 2010. Retrieved December 14, 2010. ^ Anoop Gantayat (20 December 2010). "This Week's Early Flying Get - Added 18:13". Andriasang. Archived from the original on 7 July 2011. Retrieved 20 December 2010. ^ Square Enix (March 22, 2011). Dissidia 012 Final Fantasy. PlayStation Portable. Square Enix. Lightning: Kain. Cosmos called us again. Why do you suppose that is? / Kain: Who knows? / Lightning: I want...I intend to win this fight. I win, and I get my memory back. I get to go back home. I keep telling myself that, just like everyone else. But you know...now that I've been here awhile... Sometimes I have to wonder if winning really means we'll get to go back home at all. If it might be that winning...won't change a thing. I just...I can't help but wonder. ^ Gantayat, Anoop. "Dissidia 012 Final Fantasy World Map Details". andriasang.com. Archived from the original on 25 December 2012. Retrieved 3 January 2013. ^ Spencer (December 24, 2010). "Dissidia 012: Final Fantasy Jump Festa Trailer Leaps Onto The Internet". Siliconera. Archived from the original on December 25, 2010. Retrieved December 24, 2010. ^ Bastien (January 12, 2011). "Dissidia 012 : Yuna officialisée dans la presse". Final Fantasy Ring. Archived from the original on January 17, 2011. Retrieved January 12, 2011. ^ a b Anoop Gantayat (October 26, 2010). "Dissidia 012 Final Fantasy Site Gets A Healthy Dose of Tifa". Andriasang. Archived from the original on October 29, 2010. Retrieved December 14, 2010. ^ Ludwig Kietzmann (January 11, 2011). "Dissidia Duodecim demo unlocks Aerith assistant in full game". Joystiq. Archived from the original on January 21, 2011. Retrieved January 11, 2011. ^ Square Enix (March 22, 2011). Dissidia 012 Final Fantasy. PlayStation Portable. Square Enix. Lightning: Cosmos, the goddess of harmony, imbued us with the power she said we would need in order to fight Chaos. What she gave us was something we had no way of using on our own--divine energy that would rest inside us, awaiting the proper catalyst. According to her, it was a strength that would be tempered through battle--by our own wills--and would eventually coalesce to form a crystal. As she told it, that crystal would then grant us, her soldiers, power to rival that of the gods themselves. So, simple as that. Fight the armies of Chaos, collect your crystal, and go take down the god of discord. ^ Square Enix (March 22, 2011). Dissidia 012 Final Fantasy. PlayStation Portable. Square Enix. Garland: Manikins are merciless. They know only how to deliver death and destruction, from which there can be no return. ^ Square Enix (March 22, 2011). Dissidia 012 Final Fantasy. PlayStation Portable. Square Enix. Kain: Manikins... Hm. I wonder. How do you place our odds? Against numbers like these, do you think we actually stand to win? / Warrior of Light: I cannot speak for the outcome, but we can fight as long as we have strength. / Kain: That's one answer. You are correct. We can fight for as long as we have strength, and almost certainly lose. But IF! IF there were a way to make winning possible, by accepting that loss as inevitable... / ... / Lightning: You're taking down your own allies and putting them to sleep so they'll get revived? ^ Square Enix (March 22, 2011). Dissidia 012 Final Fantasy. PlayStation Portable. Square Enix. Lightning: Say your 'next battle' were to start now. There wouldn't be any fewer enemies out there. And starting over fresh doesn't guarantee we'd get our crystals any faster either. At the very least, we might as well cut their numbers down first. It sure can't hurt, can it? And it might just give us a shot. / Laguna: Guess now's as good a time as any. Just happens I've got some intel that might change the whole game. You wanna even our odds? Try this on: I know where the manikins are coming from. ^ Square Enix (22 March 2011). Dissidia 012 Final Fantasy. PlayStation Portable. Square Enix. Vaan: What about Cosmos? / Kain: It's too late. / Vaan: "Too late"?! / Laguna: Even if we did go back, we'd never make it in time. Only thing we can do is trust our last line of defence to hold. ^ Square Enix (March 22, 2011). Dissidia 012 Final Fantasy. PlayStation Portable. Square Enix. Lightning: I'm sure you all understand our...situation. We came here to destroy the portal that connects this world to the Rift. It's the last thing left for us to do. But once we charge into the middle of those manikins, there's no coming back. ^ Square Enix (March 22, 2011). Dissidia 012 Final Fantasy. PlayStation Portable. Square Enix. Moogle (Cid of the Lufaine): The replica of Chaos you defeated was based on him at the time of sealing. I assume both Chaos and Shinryu have increased their powers since then. --I do apologize. I didn't mean to scare you. Beyond here awaits Chaos. --Let's go. ^ Dissidia Final Fantasy Ultimania (in Japanese). Square-Enix. 2009. pp. 696–699. ISBN 978-4-7575-2488-0. ^ a b Gantayat, Anoop (September 27, 2010). "Dissidia 012 Final Fantasy Developer Interview". Andriasang. Archived from the original on September 30, 2012. Retrieved July 3, 2012. ^ a b c d "Dissidia 012[duodecim]: Final Fantasy Director Discusses Fighting Game Mechanics". Siliconera. March 18, 2011. Archived from the original on July 17, 2012. Retrieved July 3, 2012. ^ "Dissidia 012: Duodecim Final Fantasy Interview With Mitsunori Takahashi". GameSpot. February 6, 2011. Archived from the original on October 4, 2013. Retrieved July 9, 2012. ^ "Nomura Talks Up Dissidia Sequel". 1UP.com. September 15, 2010. Retrieved July 9, 2012. ^ Gantayat, Anoop (November 15, 2010). "Vaan Sees a Voice Change in Japanese Dissidia Final Fantasy". Andriasang. Archived from the original on November 18, 2010. Retrieved November 16, 2010. ^ Studio BentStuff. Dissidia 012 Final Fantasy Ultimanina -Action Side- (in Japanese). Square Enix. Archived from the original on 2012-01-28. ^ Gantayat, Anoop (January 21, 2001). "Yuna and Many Third Forms at the Dissidia Duodecim Final Fantasy Official Site". Andriasang. Archived from the original on October 24, 2012. Retrieved June 14, 2012. ^ Gantayat, Anoop (January 21, 2011). "Yuna and Many Third Forms at the Dissidia Duodecim Final Fantasy Official Site". Andriasang. Archived from the original on March 24, 2011. Retrieved January 21, 2011. ^ "Pirate Vaan and Gunner Yuna Hit Dissidia Duodecim Final Fantasy Next Week". Archived from the original on December 25, 2012. Retrieved August 7, 2012. ^ "DISSIDIA 012[duodecim] FINAL FANTASY EXPANDS WITH NEW DOWNLOADABLE CONTENT OF FRANCHISE FAVORITES". Archived from the original on June 19, 2011. Retrieved June 18, 2011. ^ M., Alexis (March 18, 2011). "An interview with Kidneythieves on their Dissidia 012 duodecim Final Fantasy track with Square Enix and their upcoming music". Gaming Bits. Archived from the original on September 17, 2011. Retrieved August 1, 2012. ^ "Dissidia 012 Final Fantasy Original Soundtrack". Square Enix Music. Archived from the original on April 15, 2012. Retrieved August 1, 2012. ^ "Dissidia 012: Duodecim Final Fantasy for PSP Reviews". GameRankings. CBS Interactive. Archived from the original on February 14, 2018. Retrieved September 20, 2018. ^ Kat Bailey (March 15, 2011). "Dissidia 012 Final Fantasy Review". 1UP.com. Retrieved March 15, 2011. ^ a b Anoop Gantayat (February 23, 2011). "This Week's Flying Get". Andriasang. Archived from the original on February 26, 2011. Retrieved February 23, 2011. ^ a b Joe Juba (March 23, 2011). "Dissidia 012 Review: Focusing On Action Instead Of Polish". Game Informer. Archived from the original on March 16, 2012. Retrieved 2013-04-27. ^ Kevin VanOrd (March 15, 2011). "Dissidia 012: Duodecim Final Fantasy Review". GameSpot. Archived from the original on March 17, 2011. Retrieved March 15, 2011. ^ a b Ryan Clements (March 15, 2011). "Dissidia 012: Final Fantasy IGN Review". IGN. Archived from the original on March 16, 2011. Retrieved March 15, 2011. ^ "Dissidia Final Fantasy Sequel and 3DS Top the Charts". Andriasang. March 10, 2011. Archived from the original on October 24, 2012. Retrieved July 11, 2012. ^ "These Were The 30 Best-Selling Games Of 2011 In Japan". Siliconera. January 16, 2012. Archived from the original on June 23, 2012. Retrieved July 3, 2012. ^ PSM3 Staff (March 14, 2011). "Dissidia 012: Final Fantasy Review". CVG. Archived from the original on January 21, 2013. Retrieved March 14, 2011. ^ "Best PSP Games". GamesRadar. January 2, 2012. Archived from the original on May 2, 2012. Retrieved April 28, 2012. ^ "The Top 25 PSP Games". IGN. September 30, 2010. Archived from the original on April 18, 2012. Retrieved April 28, 2012.